By the Power of Grayskull, Hollywood may have found its new He-Man. The Wrap is reporting that Sony is in talks with Noah Centineo to headline the upcoming reboot of Masters of the Universe. According to the story, Centineo is being courted for the role of He-Man, but it doesn’t mention he would also play He-Man’s alter ego, Prince Adam. Centineo established himself with roles in To All The Boys I’ve Loved Before and Sierra Burgess Is a Loser. Centineo will return for To All The Boys 2, and he has a co-starring role in the Charlie’s Angels reboot. The Wrap suggests that Centineo’s performance in Charlie’s Angels is the reason Sony wants him to be He-Man. Dolph Lundgren portrayed He-Man in 1987 for the first Masters of the Universe film. However, the characters date back to 1982, when Mattel debuted the Masters of the Universe toyline. The subsequent He-Man and the Masters of the Universe cartoon series made its titular hero into an ’80s icon. A reboot series aired on Cartoon Network in 2002. Sony has attempted to get a new Masters of the Universe movie into production for several years. Iron Man scribes Matt Holloway and Art Marcum rewrote the most recent draft of the film. Aaron and Adam Nee are going to direct the movie, which doesn’t yet have an official start date. What do you think about Noah Centineo as the new He-Man? Share your thoughts in the comment section below! 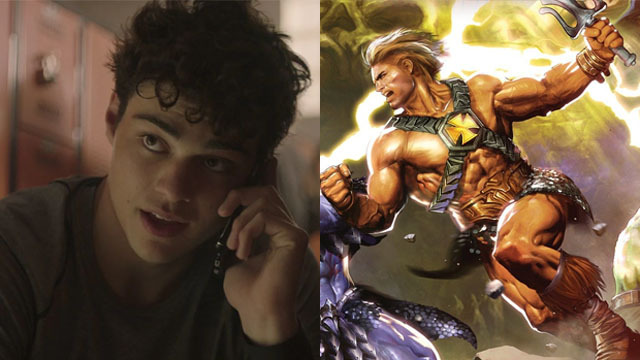 The post Noah Centineo May Play He-Man in Masters of the Universe Reboot Film appeared first on ComingSoon.net.